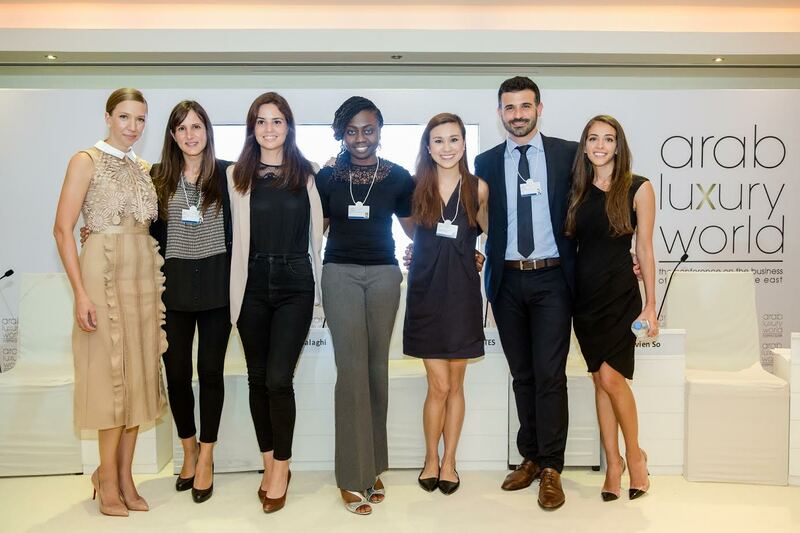 Dubai, UAE: Arab luxury world 2017, the Middle East’s leading luxury business conference, has announced the winners of its first-ever Global Student Competition, which was launched to showcase the views of the next generation on the future of the luxury, design and fashion businesses. Lama Balaghi from INSEAD Business School and Vivien So from Savannah College of Art & Design (SCAD) wrote the winning entries, which were judged by a jury of sector experts on May 21 and announced on May 23 during the second day of the conference at The Westin, Dubai. Lama Balaghi’s entry – ‘The Internet of Fashion’ – focused on how the ‘Internet of Things’ is transforming the future of fashion, including the optimisation of manufacturing processes and customer targeting, while Vivien So’s paper on ‘Millennials & Luxury: Today, Tomorrow & The Future’ explored how the concept of ‘luxury’ will morph over time with the changing economic, environmental and social landscape. Both topics reflected the conference’s overarching focus on ‘Digital Disruption and Emotional Engagement’, and added fresh insights to the expert discussions that Arab luxury world has become renowned for. The two winners were selected from five shortlisted students, who were all flown to Dubai to present their entries to a panel of judges, including Robert Meeder, Professor of Luxury Fashion Management at SCAD Hong Kong; Dr. Anne-Flore Maman Larraufie, founder and owner of SémioConsult and Academic Director at ESSEC Business School; Hatem Alakeel, Saudi designer; Elda Choucair, CEO of PHD MENA; Craig D’Silva, Head of PR and Corporate Communications at INFINITI Middle East; and Dr T B (Mac) McClelland Jr, President and Chief Executive Officer of Center House Ltd. The students also took part in the dedicated ‘Next Gen’ panel discussion of the conference, which offered attendees unique insights from the next generation on topics ranging from products and design, to fashion, marketing and how youth will consume premium goods. In its first edition, Arab luxury world’s Global Student Competition has served to foster cooperative relationships and exchanges with some of the world’s most prestigious universities, attracting a high level of entries from leading institutions including Savannah College of Art & Design (SCAD), Hong Kong and USA; Columbia Business School, USA; the International University of Monaco, France; INSEAD Business School, France; Hautes Etudes Commerciales de Paris (HEC), France; ESSEC Business School, France; and Bologna Business School, Italy. Arab luxury world serves as a dynamic platform for regional and global professionals from the premium goods and services market to engage in meaningful discussions about the latest trends and core challenges facing the luxury industry today. The conference featured more than 30 separate activities spread over the two days, with participation from industry leaders, luxury brands, distributors, agents, retailers, mall operators, service providers and media representatives. The event has grown into a global networking platform that is generously supported by key movers in the industry, including Gold Sponsors Laha magazine, Jamalouki magazine and OMD; Bronze Sponsor AMEX; Official Car Sponsor INFINITI; Nespresso; Trade Association Partner The American Business Council of Dubai and Northern Emirates; Official Print Media partner Arab News; and Media Partners Haya magazine and Sayidaty magazine. Mediaquest is one of the region’s largest, most successful and most influential privately owned media companies. Established in 1997, Mediaquest’s mission is to inform, educate and entertain audiences across the MENA region, thereby building bridges between the Arab world and the West. Mediaquest generates a combined online and offline portfolio of more than 20 titles, covering marketing, communications, women’s interests, lifestyle, entertainment and automotive. Reputed brands include: Marie Claire Arabia, Haya magazine and Buro 24/7 Middle East, as well as the highly regarded business-to-business media: TRENDS, Saneou Al Hadath, AMEinfo, Arabies, Gulf Marketing Review and Communicate. Mediaquest’s dedicated dotmena network hosts 75 premium websites that attract more than 41 million unique visitors each month. Mediaquest creates, project manages and delivers some of the region’s best-known industry events, including the Arab luxury world, a conference on the business of luxury; the Top CEO Conference and Awards; the Festival of Media MENA Conference and Awards; the Marketing to Women Conference; and the prestigious annual MENA Effie Awards, which are recognized as a benchmark for achievement in the region’s marketing sphere. Previous articleCan Your Business Card Speak On Behalf Of You?